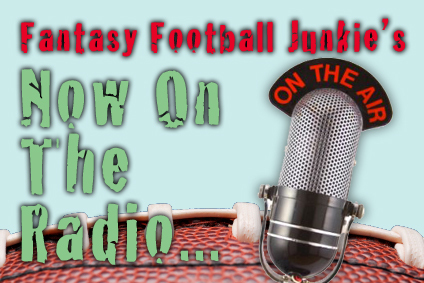 Thought I would drop this on you, the Junkie just appeared as a guest on the Fantasy Feast radio show. A great fantasy show with Brandon Berg and Caleb Parkinson from Fantasy Guideline. Had a great time talking, hopefully I don’t sound like too much of a tool. I was a little nervous and accidentally said McNabb would be a top 14 pick for the year, lol. I meant just this week! Airs on Blog Talk Radio, Tuesday nights from 11pm – 12:30 EST and can replayed anytime. Specifically, I show up at around the 55 minute mark to talk start and sit options. That’s great man. I know you’ll do a good job. Thanks Frog, after listening to it later, I thought it sounded good for a first time. Thanks Tim, sorry you didn’t get that trade in time! It would have been a heck of a one-two punch at WR. Maybe someone else is looking for a QB upgrade? Maybe the guy who owns Matt Ryan or Josh Freeman?